STOCKTON - Feb Yokoi and some of his band of brothers Saturday finally received their Congressional Gold Medals last Saturday. A ceremony in Sacramento honored local Japanese-American World War II veterans who were unable to travel to Washington in November for honorary recognition by President Barack Obama. 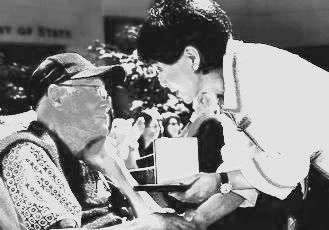 Yokoi, who was born in Stockton in 1919 and was a longtime Linden resident, was among 28 honorees as Congresswoman Doris O. Matsui, D-Sacramento (Poston camp 3) , presented the medals to members of the famed 442nd Regimental Combat Team, the 100th Infantry Battalion and Military Intelligence Service officers. Many of the 442nd team members volunteered to serve despite their families remaining behind in internment camps. But the 442nd, a segregated division of Japanese-Americans, fought bravely in Italy and France, and it became known as the "Purple Heart Battalion" because of their high casualty rate. The 442nd became the most decorated unit in U.S. military history for its size and length of service, with more than 18,000 individual decorations for bravery, 9,500 Purple Hearts, and seven Presidential Distinguished Unit Citations. Yokoi resides in a board and care home in Sacramento and is battling Alzheimer's. He came to the ceremony with his children: Richard, Jan, Scott and Kevin Yokoi. "The ceremony was very moving and touching," said his daughter, Jan Yokoi. "Even though it's all these years later, it's still very nice." Feb Yokoi went through boot camp in Fort Ord, and he became a sergeant and medic while at Fort Sheridan, Ill., before being sent to Europe. His parents, Kenjiro and Komatsu Yokoi, were interned at Tule Lake. "All of our veterans serve and sacrifice, but these men ... did so much in the face of unparalleled discrimination and prejudice," Matsui said Saturday and in a statement released by her office. "Not only from a foreign enemy, but from the country they love and served." Jan Yokoi said her father rarely discussed his time in World War II. "Being a medic, he would say he saw some horrible things and leave it at that," she said. Feb Yokoi was discharged in December 1945 after having earned a Purple Heart, a Medical Badge and a Bronze Badge for marksmanship. Through the GI Bill, he earned his Associates degree in Business Administration at Sacramento City College. He married Amy Kaneno in 1948 and went into carpentry, owned. He also operated the Lincoln Theater in Sacramento, and he later worked for the U.S. Postal Service. Yokoi also is a proud grandfather to Cameron, Kelly, Alex and Ann Yokoi. "He is very reserved and quiet," his son Kevin Yokoi said. "But also very generous and loving. He loves having family around."